Check out this article from WeddingWire! Anne Chertoff nailed these ideas! Give 800.WE.CATER to talk to an Event Expert at Soprano’s Catering about our exciting Food Station Options! Cocktail hour is the perfect time for guests to mix and mingle while enjoying delicious food, drinks, and entertainment. Over the past few years couples have decided to add more interactive elements to their cocktail hour—and we love all the wedding food station ideas, which allow guests to make their way around the room and choose for themselves various delectable and scrumptious items their hosts have planned for them. Couples should work with their caterer, event designer or florist and stationer, to create not just a delicious menu, but a beautiful display that complements the rest of the wedding décor. The table style, linens, florals and signage for your wedding food stations should all seamlessly mesh with the wedding’s look and feel. 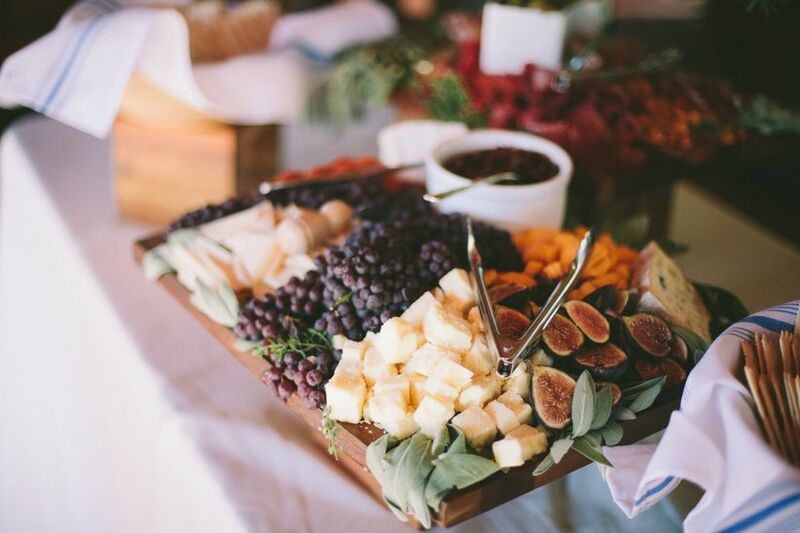 Here’s a list of 16 wedding food station ideas to add to your cocktail hour menu. Couples often want to personalize their wedding menu with foods that celebrate their backgrounds, or the fusion of both of their heritages. Or if you’re having a destination wedding you’ll want to serve up local foods that highlight the culture. Here are some cultural wedding food station ideas for your wedding. 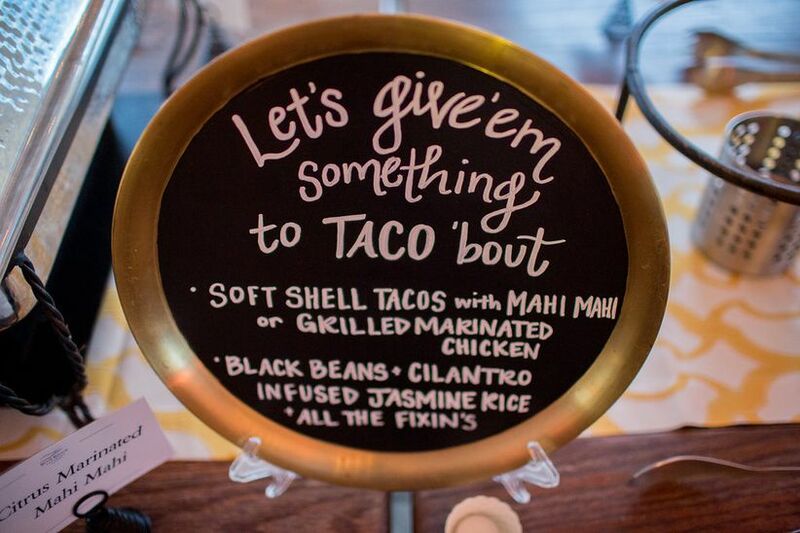 A taco bar can be interactive by allowing guests to build their own, but that also leaves room for making a mess of their fancy duds. To help avoid any fashion disasters you can have a server behind the table to help people create their own tacos, or make sure that the toppings aren’t dripping with grease, sauce or overly messy. You’ll need the basics: guacamole, pico de gallo, cheese, lettuce, cilantro and beans. But then you can get creative with other ingredients: shrimp, chicken, pork, beef, pickled cabbage, corn, rice, sour cream and jalapeños. Celebrate one or both families’ Italian heritage with an antipasto bar. With a mix of vegetables, meats and cheeses to choose from you’ll be able to create a wide variety that will suit every appetite. Here are some yummy ideas to consider: For meats opt for prosciutto, pepperoni and salami. Vegetables, such as artichokes, asparagus, eggplant, peppers and tomatoes can be grilled and/or marinated. Make sure to serve a range of cheeses – Drunken Goat, Manchego, Gouda – and olives too. Breads can be toasted or not, but have a few plain and flavorful options, such as garlic bread and focaccia. Tapas bars have become very popular in the past few years, so if you and your fiancé enjoy going to them create a tapas bar during your cocktail hour. Include cheeses, fried olives, garlic shrimp, chorizo, empanadas and shots of gazpacho in your Tapas Bar menu. You can also pair the menu with a selection of Spanish wines. A pasta station may sound and even look delicious, but it’s hard to eat Spaghetti Bolognese or Fettuccini Alfredo neatly, especially when you’re standing. Go for an Italian-inspired food station with a Rustic Pizza Bar. You can serve up slices from a personal pizza (12” across) so it’s not a full meal and much more manageable to enjoy while working the room. The pizzas can range from classic Margherita to a white Bianca, and with an assortment of toppings from vegetables to meats. 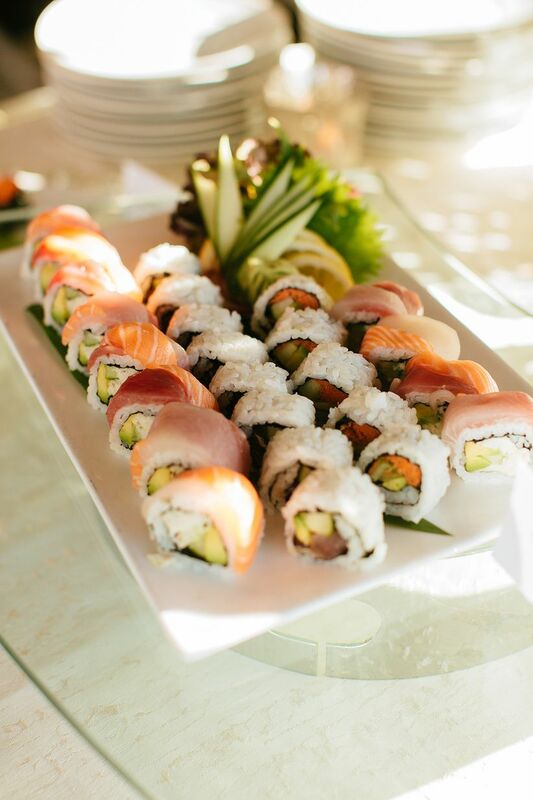 One of the most popular wedding food station ideas, you’ll find a sushi station at almost any wedding, but have yours stands out by making it more interactive than just picking out the pieces you want to eat. Ask your caterer if you can have one or two sushi chefs behind the table making custom rolls for those who don’t want the ones available. Popular sushi rolls to already have made include: Alaska Roll, California Roll, Dragon Roll, Philadelphia Roll, Rainbow Roll, Shrimp Tempura Roll and Vegetable Roll. Who wouldn’t love a station filled with warm pita and spreads to dip them in? Couples with Middle East or Greek backgrounds can serve a Mediterranean Bar with a selection of spreads – hummus, baba ghanoush, labneh, cacik, htipiti and ezme – olives, crostini with cheese and salads. Asian foods can include a wide range of delicacies from China to Japan to South Korea to Thailand. Depending on what country your menu is from choose a variety of dishes, and make sure not everything is too hot and spicy. For dishes that are, be sure they’re clearly labeled. Dim-sum style dishes that are bite sized include: dumplings (vegetarian, pork, chicken or shrimp), spring rolls, shrimp toast and chicken satay with peanut sauce on skewers. Personalize your wedding with your favorite foods from home. Whatever region of the country you’re from or getting married in you can include popular foods and flavors from the area with unique wedding food station ideas. A southern-inspired menu can be a mix of bite-sized comfort foods or heartier dishes. It all depends on whether you want your guests to sit and dine or take a bite and move on to the next station. Sandwiches like pulled pork sliders or biscuits with fried chicken can be eaten with hands, while shrimp and grits, fried chicken and waffles and mac n cheese will need cutlery. Other items to add to a Southern Comfort Food Station includes fried green tomatoes, buttermilk biscuits and collard greens. A wedding in a coastal New England state (Maine, Massachusetts, Rhode Island or Connecticut) calls for a traditional New England Clam Bake Station. If your wedding is more formal in style you may want to forgo the mallets and have shells cracked for easy access. The station should be stocked with lobsters, clams and corn on the cob. For an authentic look and feel consider a newspaper or red and white checkered table cloth. 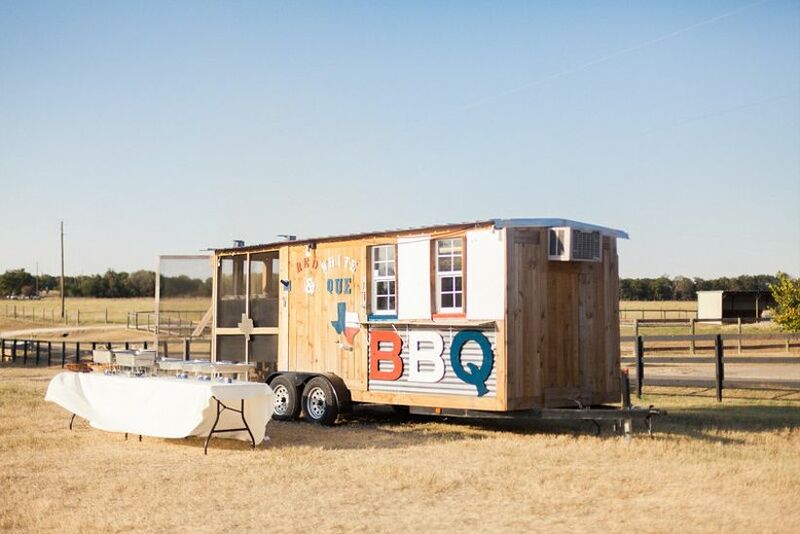 There are specific barbecue styles across the Midwest and South so a BBQ Food Station at a wedding cocktail hour can incorporate a range of rib recipes and sides, including Texas, Memphis or Kansas City ribs (there are other regional recipes in addition to these), baked beans, coleslaw, cornbread, biscuits, collard greens, potato salad and pickles. There are some wedding food station ideas that you can be sure everyone will enjoy. Setting up one or more classic food stations will ensure that those guests who don’t have adventurous taste buds will still find delicious options to eat during your cocktail hour. 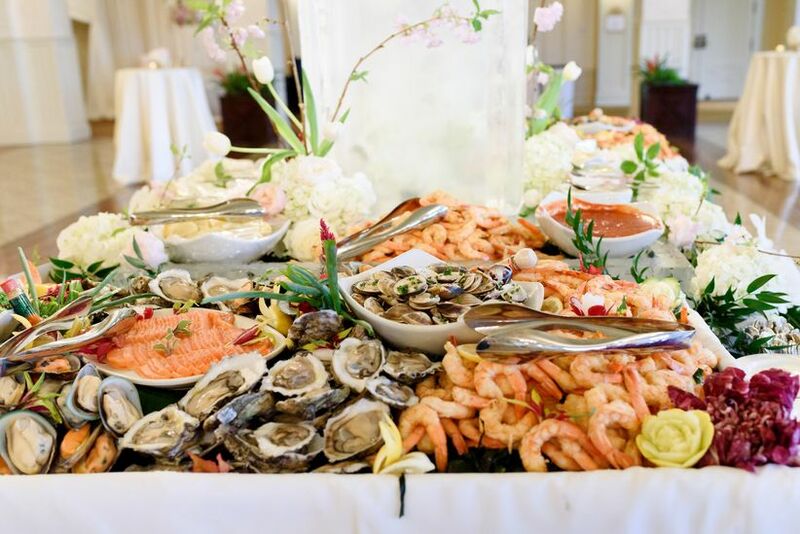 A raw bar can be as elaborate as you want it to be based on your favorite shellfish and your budget. Any combination of chilled lobster, crab legs, shrimp, clams and oysters is acceptable for a raw bar, or you can limit the selection to East Coast and West Coast oysters – plus lemon, cocktail sauce and mignonette. Curating an impeccable Cheese and Charcuterie Station is not as difficult as you may think. Start with a selection cheese in a variety of textures – soft, firm, aged and blue – and milks – cow, goat, sheep. For meats, you also want a range of textures and flavors from smoky to dry-cured. Salami, prosciutto, ham and duck are some of the meats to add to the platters. Once your cheese and meat selects have been finalized, add some spreads (fig, honey, mustards) and dried fruits, olives, cornichons and nuts. Probably the yummiest of all comfort foods, a Mac & Cheese Bar may be the most popular cocktail hour food station. In addition to cheddar cheese, you can have mac n cheese at your wedding made with Gouda or Gruyere, Monterey or Pepper Jack, Feta or Parmesan. Let guests customize their dish with an assortment of toppings — bacon, broccoli, ham, jalapeños, lobster, mushrooms and any other family favorites you’re sure they’ll enjoy. A bowl of mashed potatoes – white or sweet – can be the perfect warm indulgence. Add some toppings – friend onions, brown sugar, sour cream, chives, cheddar cheese and bacon – to mix in for bursts of flavor. Whether or not you’re inviting kids to your wedding, there are plenty of adults who enjoy kid-friendly food. Consider adding one of these childhood favorite wedding food station ideas to your cocktail hour. You can have large soft pretzels or pretzel nuggets on display with plenty of sauces to enhance their flavor. Mustards, melted cheese, BBQ sauce, chipotle dip, Nutella, beer and cheddar dip are some tasty options. Today you can find plenty of flavorful option for a bucket of popcorn. 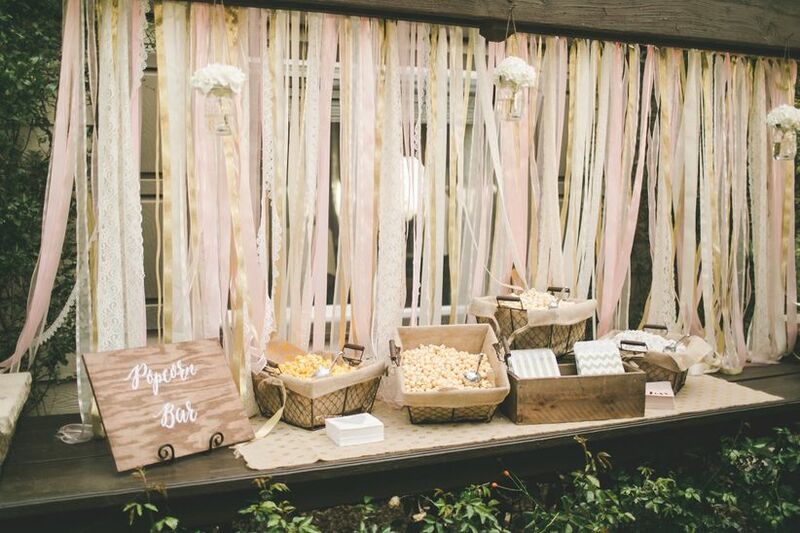 Set up a Popcorn Station for guests to try all sorts of popcorn from classics like butter and caramel to cheesy cheddars in yellow, white or jalapeño flavors to more modern varieties like butterscotch and kettle corn. Work with your caterer and stationer to create themed paper cup holders that complement the wedding’s theme.